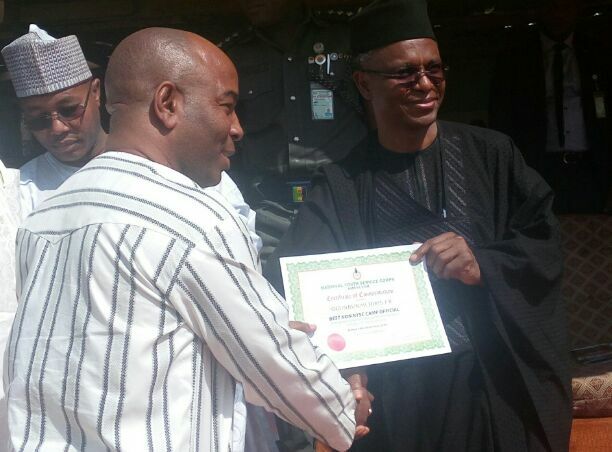 Kaduna State Governor, Nasir El-Rufai on Wednesday gave N500,000 each to two best camp officials during the closing ceremony of 2016 batch ‘B’ orientation course in Kaduna on Wednesday. They are Mrs. Silifatu Bamidele and Alhaji Idris Ogunbunmi, all served in different capacity during the 21-day orientation course in Kaduna. There were also three corps members that also got N100,000 each for exhibited exemplary commitment while on camp. The State Coordinator, Prince Muhammed Momoh, who was happy that the governor was on ground, announced the duo without prior notification, saying the gesture was a delebrate move to reward hardworking staff without knowing. Governor further louded the idea and promised to support the state coordinator by given the rewardees the said amount. He then urged them and colleagues to do more. This is the first time this is happening in the history of NYSC in the State.